The Bronze EMI releases were pressed by Hayes pressing plant for EMI at Middlesex near London. UK test pressing with white labels have some kind of stamp in purple ink on the label, band name and cat no. Some test pressings are with two single sided LP´s (WLPOC 515 according to Olivers list). There are also test pressings with a proof cover and an included biography, these were used for promotion. I have also seen copies with completely white labels without stamps or writing, but those copies later turned out to be fake! Vinnie Reed, also known as bluepyevinnie or aliasthecompass, once sold a fake white label on Ebay of Overkill to me. At that time he claimed that copies with green labels came direct from the pressing plant, not through the record company. When I asked him about the rubber stamp that I so far had spotted on previous test pressings he said that there were 5 copies that had completely white labels without rubber stamp and those were requested for band/management. Two of those came from the same man. He was a roadie for Motorhead for years and he was also drum roadie for MAMMOTH back in the 80's. He was also a sound engineer for Motorhead. All according to bluepyevinnie. In November 2009 another test pressing was sold on Ebay. This was housed in a well worn proof cover ("sleeve without credits" according to seller "britallica1"), stapled along two edges and with ring wear. 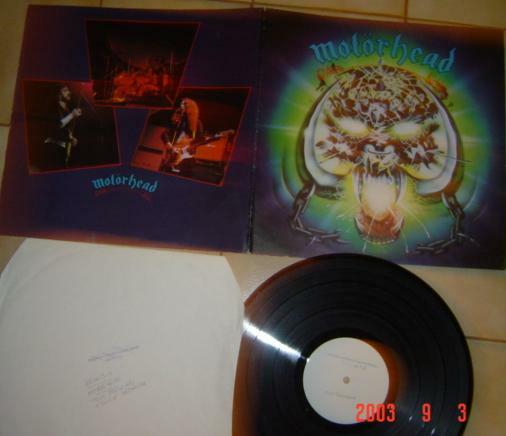 The label had rubber stamps with "Motorhead" and "Bron 515". In February 2011 a seller (poorcowvinyl) located in Singapore sold a white label copy with rubber stamp on side B. This was housed in a white die cut sleeve. The seller said that "I got this more than a decade ago from the personal collection of the head honcho of our major record company".